I just flew in from Sacramento after visiting my bestest friends in the world, one of which just had a beautiful baby girl, Xyla. She is a smooshy, perfect little baby, so pretty, so good. We have all been friends for the better part of twenty years, a couple of us a bit shorter, but no one is counting. We are very different, each with strong personalities, opinions, and love for one another. I love my best friends like they are my sisters, and we may as well be. Over the years, we have been through so much together, and personally. We have grown, and sometimes it felt like we were growing apart, but it was always just a fleeting moment. The bonds and love we have are unique. While we get older, make our own families, and memories apart, we come together when I visit Sacramento every few months to much needed coffees, talks, shopping, and meals. It’s needed. I moved from Sacramento four years ago and while it has been difficult being away from them, and the lives we once shared, our friendships are special. It was such a treat to spend time together with the addition of a baby girl. I picture us growing old, around this beautiful little girl, who will have a pack of mama bears, auntie best friends that have her back, and heart. I am grateful that I have a husband that know our friendships are so special to me, never thinking we are super weird for our bonds, and that I am able to go visit them for my woman sanity. We get pedicures, hair done, and relax together, never skipping a beat, and continuing the bond we have. I love you girls, you are the best. Ironic but totally ok with me. This recipe has nothing to with the girls, I simply had a story to tell about my girls, so hope you like both! 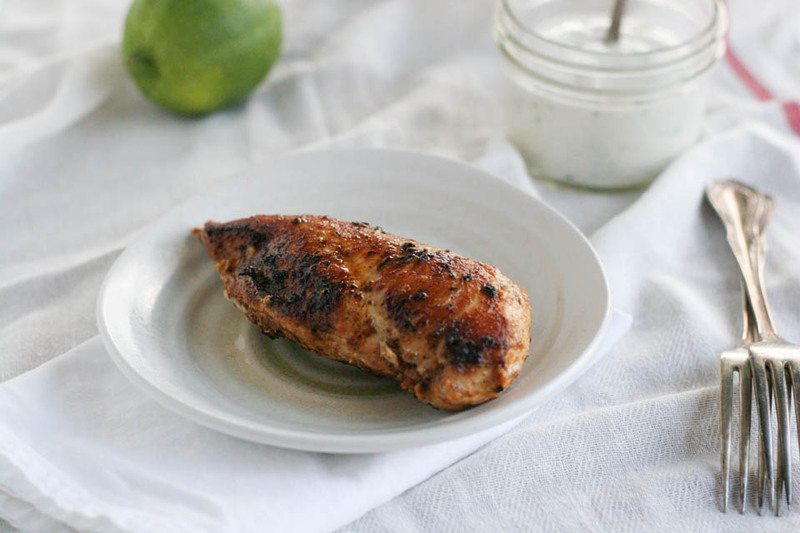 Ancho Chile Chicken with Lime Yogurt Sauce is the way to go! 1. In a medium bowl combine olive oil, 1 tablespoon lime juice, ancho chile, and salt, using a fork, whisk to combine. Rub mixture into chicken, set aside for 20 minutes on the counter to bring to room temperature. 2. In a 12 inch pan, add 2 tablespoons olive oil over high heat. Once oil is shimmering, place chicken in pan, sear for 2 minutes, lower heat to medium, cook for 10 minutes. Turn chicken and cook covered for 20 minutes, or until thermometer reads 150 degrees. Remove chicken from heat, and place on cutting board, allow to rest for 5 minutes minimum. 3. 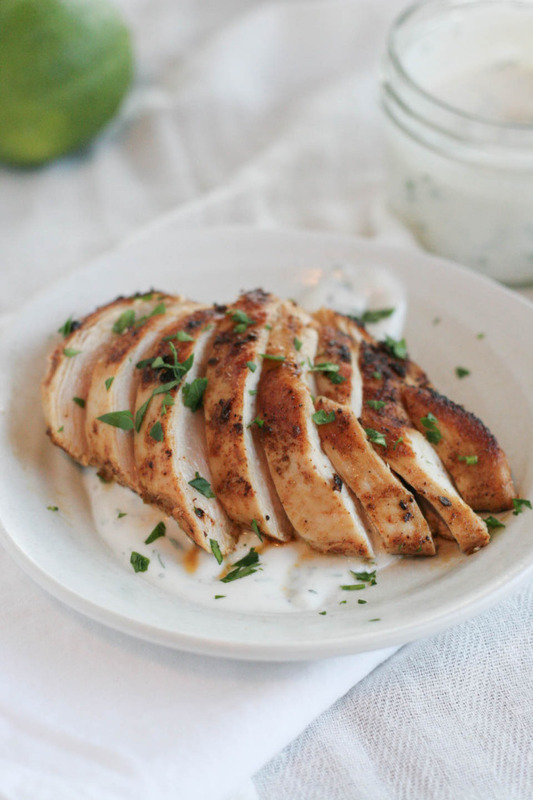 While chicken is cooking, make the yogurt sauce. Place yogurt, 1 tablespoon lime juice, parsley, 1/4 teaspoon pepper, and 1/8 teaspoon salt in a small bowl, whisk to combine using a fork. 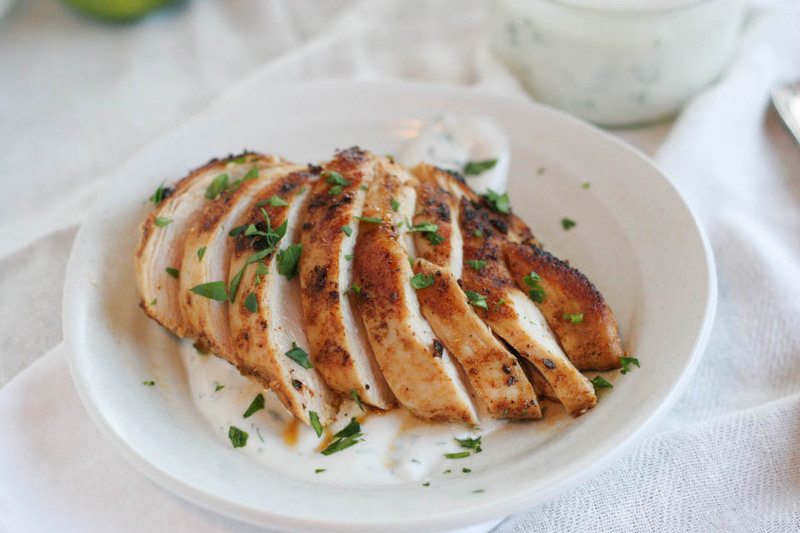 To serve, place spoonful yogurt on plate, then warm chicken on the sauce. Slicing is optional. I served this over brown rice, and made tacos with the leftovers. It would also be good over a green salad. I hear you on the friendships!! I moved from CA to Seattle and then to Madison and I had made the best friendships in Los Angeles and Seattle. . it’s sad but we try to keep in touch as much as possible! we actually met up last summer in LA and all went to Disneyland. 🙂 love this ancho chile chicken! I’m all about the ancho chile powder!! It really is so important and needed! Thank you. Aw! At least the Portland – Bay Area plane ride is seriously nice and short, right? This chicken sounds super easy and delicious too! Love the contrasting flavors in this, plus it’s pretty quick to put together. Double win! What a great weeknight meal. There is no boredom on that plate! So quick and easy! Thank you. This looks so clean and appetizing. I love yogurt sauces and the contrasting flavors here – sweet, hot, acid – sound like a great combination. I love ancho chile +lime juice together! This chicken looks so flavorful and incredible. Love that sauce with it! This Ancho Chile Chicken would be fabulous in a taco with a little shredded cabbage and some avocado. And, I bet it would be popular with the family. I like the contrast of the chile and yogurt, as well as the added zip of fresh lime juice. Thanks for making chicken breasts less boring! Totally! We hardly ever eat them, so I felt compelled to come up with something to make them better. Oh I know sweetest! This time I forgot about everything but the new baby, it was nuts, so not used to new babies! I’ll let you know with plenty of time next time I go so we can eat together :). xoxoxo I miss you.